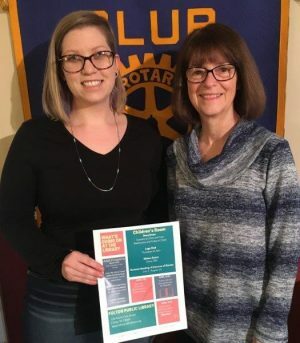 FULTON – At a recent Fulton Sunrise Rotary meeting, Rotarian Linda Rossiter, right, introduced Caroline Chatterton, Fulton Public Library director. Chatterton spoke of the many and varied children and adult programs offered at the library. Computer and Internet instruction is available now along with a plan for movie nights. There is an on-line service to reserve your book, CD, and videos, as well as, review your history. Promoting all their programs via social media is helping to make people aware of what the library offers. On May 11 there will be a fundraiser at the library with wine tasting and entertainment.